These Christian bloggers like R&RJiS! Check out their awesome blog sites at the links they provide! Theme song at www.raeganandrjinspace.com. Reading in the form of a graphic novel and written for ages 9-12, this is the story of a group of Christians that are sent to colonize the galaxy. Leaving their home in New Hope, Tennessee their mission is to set up a new colony called New Hope on a planet called New Bethlehem. Some readers may be surprised to see a female as President of the United States. One 10 year old that read this asked me if this was part of a series, because it seems there were some assumptions made of the reader. The author did a good job of mapping out the history of the crew and descriptive terms and crew assignments. 2. Ms. Rebecca! Awesome!! R&RJiS has been given 4 out of 5 Stars by a great awesome amazing super Christian Blogger!! My kids, ages 12, 11, and 9, love to read. They also love to read graphic novels. When I saw these were available to review, I knew my kids would love them. I also was interested in finding out more about these books. The illustrations are very colorful. The books themselves are clean and I didn't have to worry about the content before letting my children read them. I also like that the stories show how helpful the main characters are to others. My boys, 12 and 11, liked that there was diagrams of the ship in the books and listed the characters. I liked that the story teaches good Christian values. Overall, these are good books and we give them 4 out of 5 stars. 3. Ms. Sarah! Yeah!!! 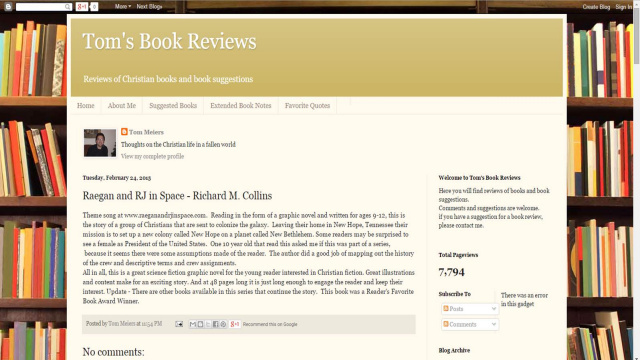 R&RJiS has been given 4 out of 5 Stars by a great awesome amazing Christian Blogger!!. **2014 Pinnacle Graphic Novel Book Award Winner** I wanted to try this series, because it was recommended. This is my kids first comic series to try and … My kids love this and want more! Raegan and RJ are a sister and brother in the CSS Faith crew. They are training with their family to be colonists in a new world called Alpha Centauri. Now there is a new family stuck on the moon. What will happen next? 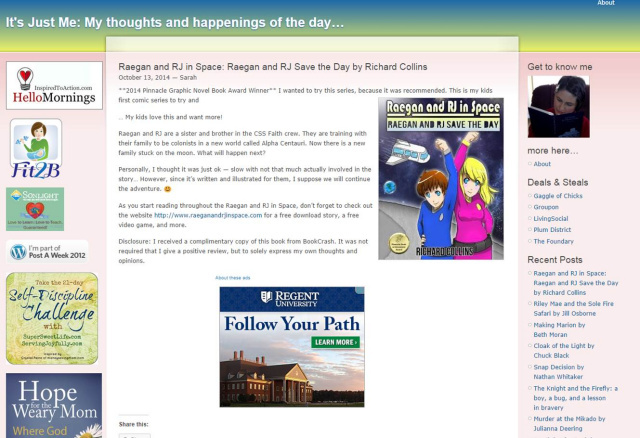 As you start reading throughout the Raegan and RJ in Space, don’t forget to check out the website http://www.raeganandrjinspace.com for a free download story, a free video game, and more. 4. Ms. Raliegh Ann! Yeah, yeah, yeah! R&RJiS has been given 4 out of 5 Stars by an awesome awesome awesome Christian Blogger!! UPS: Raegan and RJ in Space is a really neat series telling of the futuristic Christians on the moon. 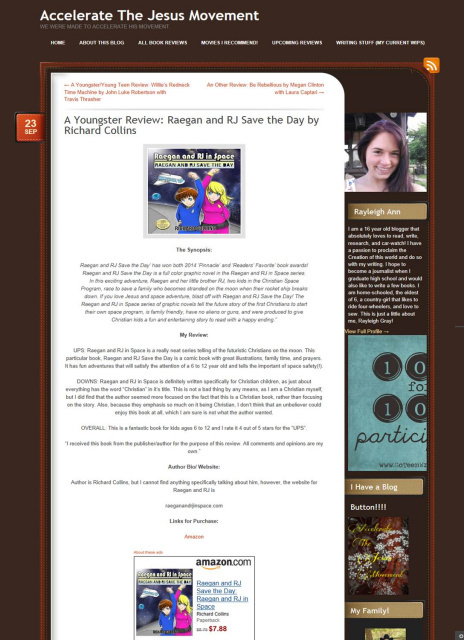 This particular book, Raegan and RJ Save the Day is a comic book with great illustrations, family time, and prayers. It has fun adventures that will satisfy the attention of a 6 to 12 year old and tells the important of space safety(!). DOWNS: Raegan and RJ in Space is definitely written specifically for Christian children, as just about everything has the word “Christian” in it’s title. This is not a bad thing by any means, as I am a Christian myself, but I did find that the author seemed more focused on the fact that this is a Christian book, rather than focusing on the story. Also, because they emphasis so much on it being Christian, I don’t think that an unbeliever could enjoy this book at all, which I am sure is not what the author wanted. OVERALL: This is a fantastic book for kids ages 6 to 12 and I rate it 4 out of 5 stars for the “UPS”. 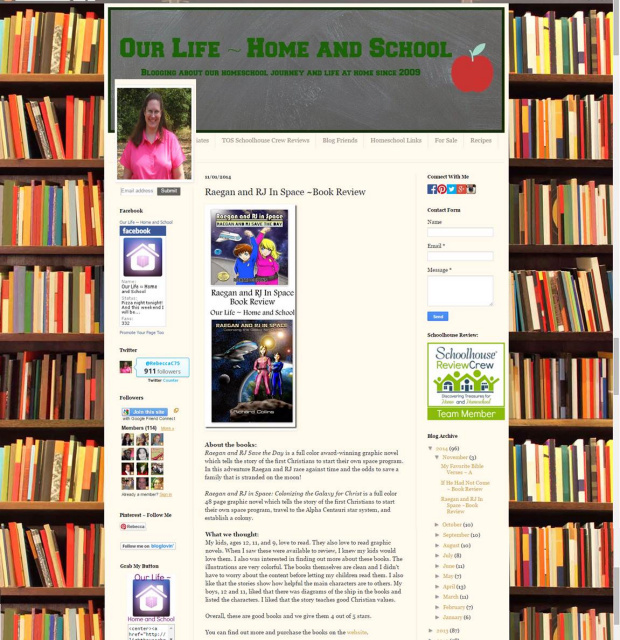 Here is the link to her BLOG Site please check it out! 5. 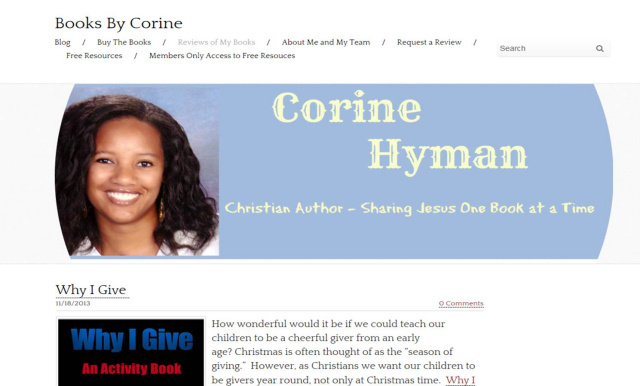 Ms. Corine Hyman! Yeah, yeah, yeah! R&RJiS has been given 4 out of 5 Stars by an awesome awesome awesome Christian Blogger!! Nice Christian Based Comic Book! Raegan and RJ in Space: Colonizing the Galaxy for Christ is a Christian based space adventure comic book for kids (and adults). What I love about this book is that it does not include any aliens, guns, or battles. Because of these features, Raegan and RJ in Space: Colonizing the Galaxy for Christ is the perfect book for the comic lover in your life. In Colonizing the Galaxy for Christ, five families leave New Hope, Tennessee and travel to the Alpha Centauri Star System in order to set up a new colony called New Hope on a new planet called New Bethlehem. On the way, the main characters, Raegan and RJ, have to complete several missions including saving the earth. My only complaint with this book is that there are no conflict resolutions (i.e., the missions all go as planned and everyone gets along). The author could have easily developed a mission that does not go as Raegan and RJ planned. By not having conflict and having everyone get along, the author misses a chance to demonstrate the sovereignty of God. However, this book models for children the importance of respecting adults, praying and giving God glory for your success. One thing that is an attention grabber is that the book includes bonus pictures of the ship layout and colony maps. 6. Ms. Laura Pol! Yeah, yeah, yeah! R&RJiS has been given an awesome awesome awesome review by a Christian Blogger!! Great Graphic Novel For kids! 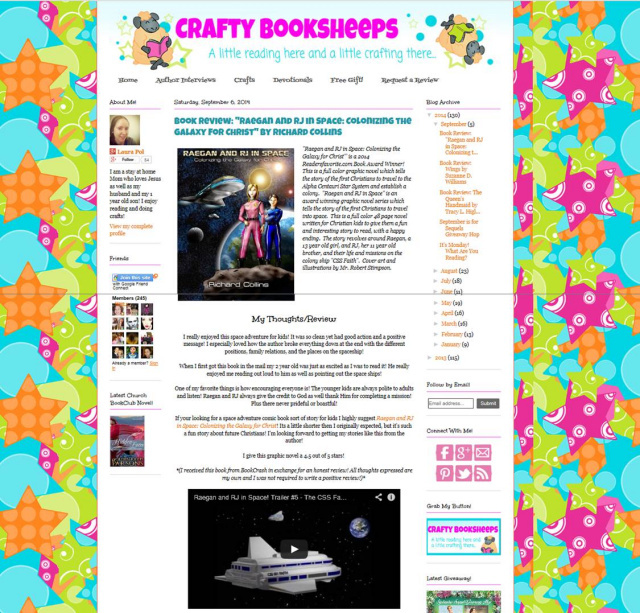 I really enjoyed this space adventure for kids! It was so clean yet had good action and a positive message! I especially loved how the author broke everything down at the end with the different positions, family relations, and the places on the spaceship! When I first got this book in the mail my 2 year old was just as excited as I was to read it! He really enjoyed me reading out loud to him as well as pointing out the space ships! One of my favorite things is how encouraging everyone is! The younger kids are always polite to adults and listen! Raegan and RJ always give the credit to God as well thank Him for completing a mission! Plus there never prideful or boastful! If your looking for a space adventure comic book sort of story for kids I highly suggest Raegan and RJ in Space: Colonizing the Galaxy for Christ! Its a little shorter then I originally expected, but it's such a fun story about future Christians! I'm looking forward to getting my stories like this from the author! I give this graphic novel a 4.5 out of 5 stars! 7. Ms. JC Morrows! Yeah, yeah, yeah! R&RJiS has been given an awesome awesome awesome review by a Christian Blogger!! A Wonderful Alterenative to Secular Comic Books! Good morning! I am reviewing a fantastic new Graphic Novel: Raegan AND RJ IN SPACE by Richard Collins. This is actually the first graphic novel I have ever read and I have to say, while I’m not much of a comics fan myself, I love it! I think it’s possible that kids of all ages will love this book! I say that because a lot of teens or young adults love comics just as much as those who are 10 or 12. This is a graphic novel that would appeal to them all, I think. And it has a WONDERFUL message too! This is a book that any parent should buy if they have children who are interested in comics of space or astronauts! Aside from the wonderful pictures and the fun story-line, the book includes many bonus pictures of the ship layout and colony maps – which I love in the Sci-Fi books I read so I’m sure kids would LOVE them! My son is obsessed with space travel and he was so excited to see that this book looked at space travel from a Christian perspective. It’s so difficult to find reading material along these lines for him. 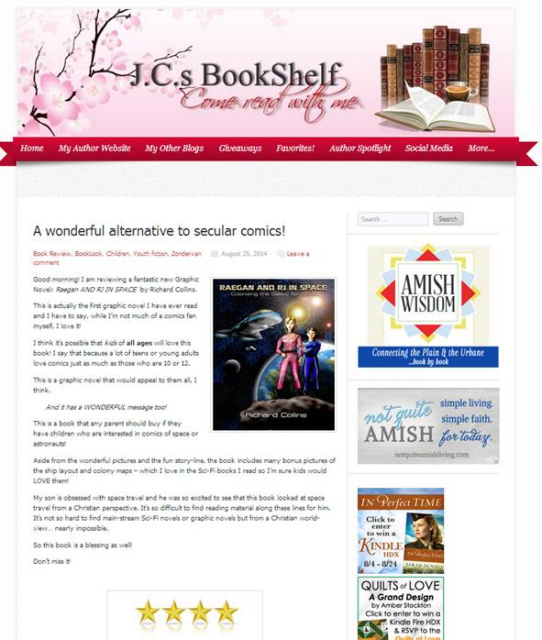 It’s not so hard to find main-stream Sci-Fi novels or graphic novels but from a Christian world-view… nearly impossible. So this book is a blessing as well!